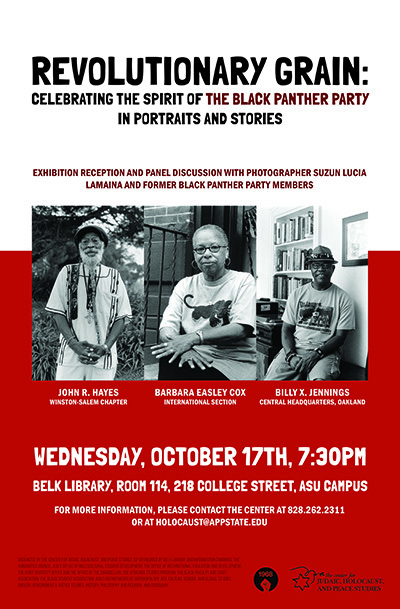 ASU's Center for Judaic, Holocaust and Peace Studies invites the public to a panel discussion with Barbara Easley Cox, Billy X Jennings and John R. Hayes (aka Ras John), former members of the Black Panther Party (for Self Defense). They are joined by photographer and college professor Suzun Lucia Lamaina, who spent five years working on a social documentary photographic essay about former Party members. The panel tackles the history and legacy of the Black Panther Party and the 1960s Black Freedom Struggle. It will take place in Belk Library and Information Commons, Room 114, on Wednesday, October 17, at 7:30 pm. The event is open and free to the public. No tickets are required. The Black Panther Party, founded by Bobby Seale and the late Huey P. Newton in October 1966 in Oakland, California, initially focused on police violence in black communities. By the times of the worldwide revolts of 1968, the Party had emerged as a national and global media icon. Thrust into a vanguard role with close to fifty chapters throughout the United States and an International Section in Algiers, North Africa, it helped to build interracial alliances on a global scale. The party considered itself engaged in worldwide revolutionary anti-capitalist, anti-imperialist, and anti-fascist struggles. At the same time, the party also quickly expanded its domestic activism in the form of “survival programs” that offered, among others, free breakfasts and medical services to thousands of black Americans. Almost from its inception, the Black Panther Party engendered massive controversy. The Nixon administration dubbed the Panthers the “ greatest danger to the internal security” of the United States. Many have spoken for and often falsified the record of the party’s activism. This panel gives a range of former members the opportunity to offer accounts of their own, which also powerfully speak to today’s political struggles. Barbara Easley Cox, a former member of the International Section, will shed light in the party’s work abroad. Billy X Jennings, active at central headquarters and, more recently, the main organizer of the Black Panther Party Legacy and Alumni project, will talk about the party’s leadership and work in Oakland. John R. Hayes (aka Ras John), finally, will illuminate the influential work of the Winston-Salem chapter, the strongest in the South, where he headed the Joseph Waddell People’s Free Ambulance Service. Furthermore, the panel will problematize the party’s anti-Zionist stances that persisted as its members continued to cooperate with leftist Jewish activists. The panel is part of the accompanying events for the traveling exhibit "Revolutionary Grain: Celebrating the Spirit of the Black Panther Party in Portraits and Stories" by California-based artist Suzun Lucia Lamaina that will be on display in Belk Library from October 15 until December 15. The exhibition commemorates the legacy of the Black Panther movement through powerful portraits and narratives originally published in Lamaina’s “Revolutionary Grain” book. The panel is also part of the Center’s program on the Black Freedom Struggle during this anniversary year and continues the many important discussions on campus about racism, police violence, the challenges of political organizing and racial justice. The program is co-sponsored by Belk Library and Information Commons; the Africana Studies Program; ASU's Chief Diversity Officer and the Office of the Chancellor; ASU’s Office of Multicultural Student Development; the Black Faculty and Staff Association, the Black Student Association; the Office of International Education and Development; the Humanities Council; and the departments of Art, Anthropology, Culture, Gender and Global Studies, English, Government & Justice Studies, History, Philosophy and Religion, and Sociology. For more information, please contact the Center for Judaic, Holocaust and Peace Studies at 828.262.2311 or holocaust@appstate.edu.